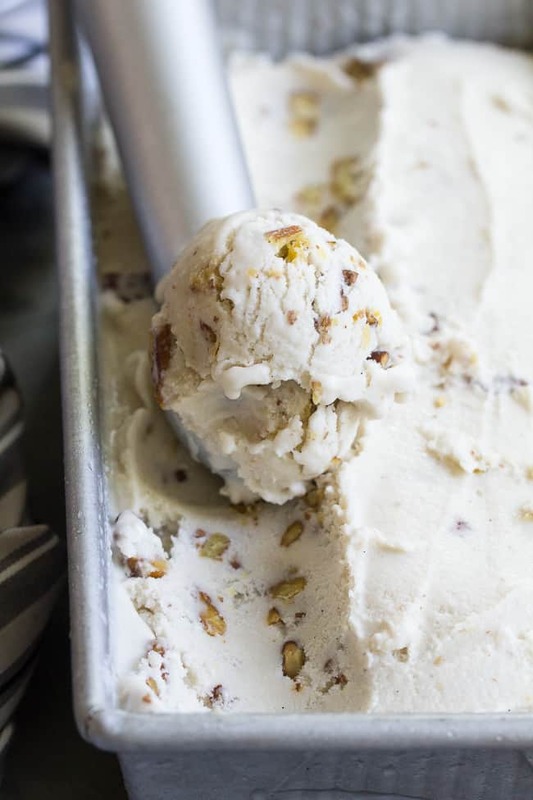 This “butter” pecan vegan ice cream is thick, creamy and decadently sweet yet made with no refined sugar or dairy. You won’t believe you’re not eating the real thing once you taste it! Paleo, vegan, gluten free, dairy-free. 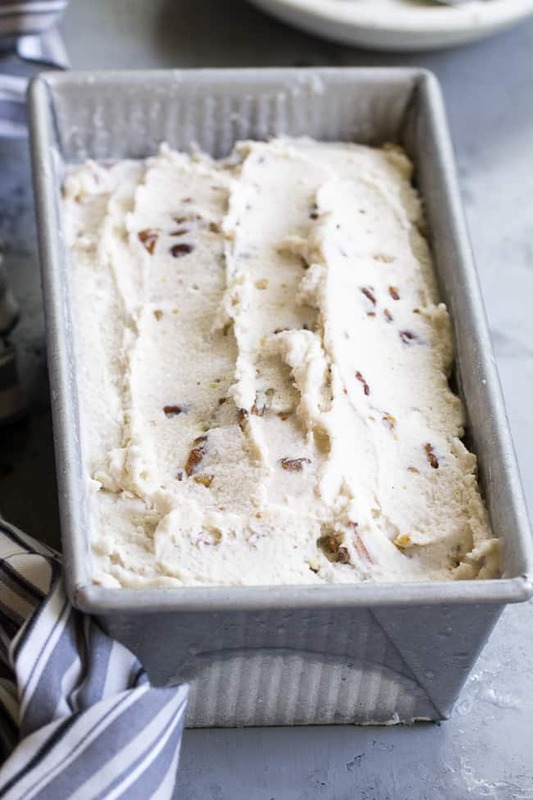 Since “ice cream season”, AKA summer, is still in full swing, we’re making more homemade ice cream today, butter pecan style! And, if you happen to be visiting in a season other than summer, no judgement of course – I’m a proud and happy year-round ice cream eater. 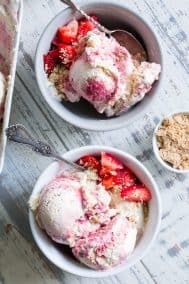 Ice cream is always worth the extra chill, in my opinion, but of course as I’m writing this, it’s about 90 degrees outside, which means it’s not only worth it, but completely necessary – are you with me?! I’ve been an ice cream lover since approximately day zero, making the whole lifelong lactose intolerance thing a challenge. As a kid/young adult I popped Lactaid pills to be able to eat as much as I wanted, in fact, my high school job was at the local Friendly’s scooping ice cream. I scooped way more than my fair share for myself back then, loading as many toppings as I could fit to take home with me after work! And now, the butter pecan details! I wanted to make this as rich and creamy as possible with that perfect salty/buttery pecan flavor throughout. Through trial and error, I wound up making a sort of sweetened condensed milk as the base of this ice cream using coconut milk and maple sugar, in a method very similar to how I make coconut milk caramel. I made it twice, and the first time I used coconut sugar instead of maple sugar. Honestly, it tasted exactly the same as the maple sugar version (I still have both in my freezer!) 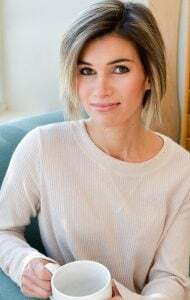 but the color was a darker caramel, which didn’t feel or look “right” to me since I was going for the traditional color. If you have lots of coconut sugar and don’t feel like ordering/buying maple sugar, by all means, you can use it! Just expect the color to look dark – just like coconut sugar does. So, after your sweetened condensed coconut milk cools, you whisk in some coconut cream and then add your pecans! 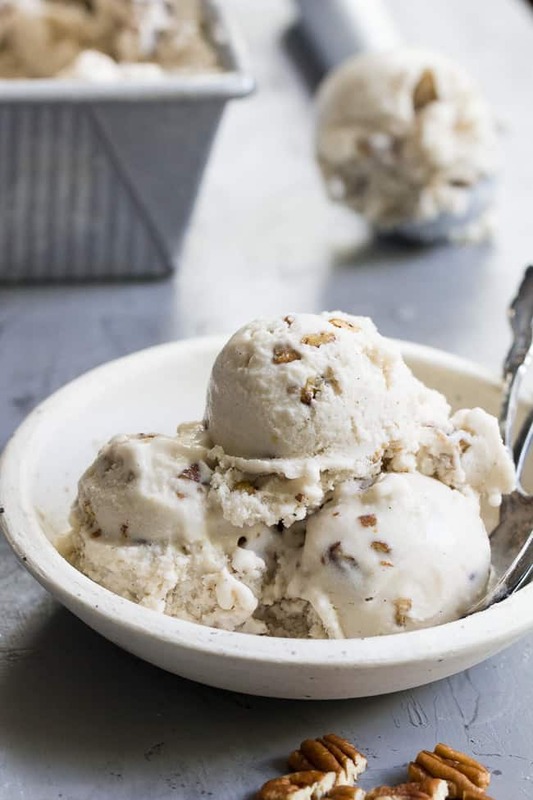 The pecans were oh-so-simple to make and were seriously addicting – I had to stop myself from eating them before putting them in the ice cream. Just pecans, coconut oil and sea salt toasted up in a skillet to utter perfection. 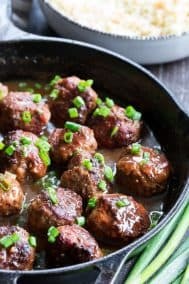 I actually used butter-flavored coconut oil to give the pecans more of a buttery flavor and color, but you can use regular refined or virgin coconut oil – whatever you prefer. If you aren’t vegan, you can also use ghee for that deliciously buttery flavor! Just make sure you’re stirring while cooking them and watching closely since they can burn in the blink of an eye – I’ve been there! For this recipe I highly recommend you use an ice cream maker to churn it. It will be MUCH creamier this way and definitely worth it if you’re into homemade ice cream. I use this one from Cuisinart and just keep the bowl in the freezer so it’s ready to go whenever I need it. I recommend putting your ice cream maker bowl in the back of your freezer (the coldest part) preferably 48 hours before using it for the best results! 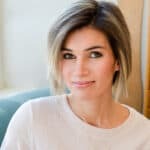 I hope you’re craving ice cream and ready to start! Let’s go!! 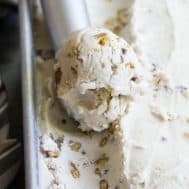 This "butter" pecan vegan ice cream is thick, creamy and decadently sweet yet made with no refined sugar or dairy. You won't believe you're not eating the real thing once you taste it! Paleo, vegan, gluten free, dairy-free. 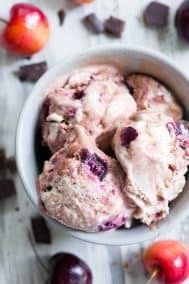 Before Starting: You will use your ice cream maker for this recipe, to prepare, chill the bowl in the back of your freezer preferably 48 hours before churning. First, you will essentially be making a “sweetened condensed” coconut milk on the stovetop. Inn a medium saucepan, add the 2 cans of coconut milk and 2/3 cup maple or coconut sugar. 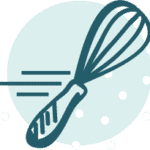 Whisk well and bring the mixture to a boil over medium/medium high heat, stirring or whisking. Once boiling, lower the heat to medium so the mixture is bubbling but not boiling over. Continue to cook, stirring occasionally to avoid burning for about 20 minutes until the mixture reduces and thickens a bit. if you used coconut sugar, it will be nearly caramel colored at this point, for maple sugar it will stay relatively light. Remove from heat and whisk in the vanilla and salt. 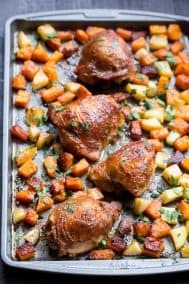 Allow to cool - you can refrigerate to speed up the process. While the mixture cools, make the pecans. Melt the coconut oil in a small skillet over medium heat and add the pecans and salt, stir to coat. Cook, stirring, for 2-5 minutes or just until the pecans are toasted. Make sure to stir while cooking to avoid burning, and remove from heat once done. When the sweetened condensed coconut milk has cooled to at lease room temperature (or colder) whisk in the coconut cream and add the mixture to the bowl of your ice cream maker. 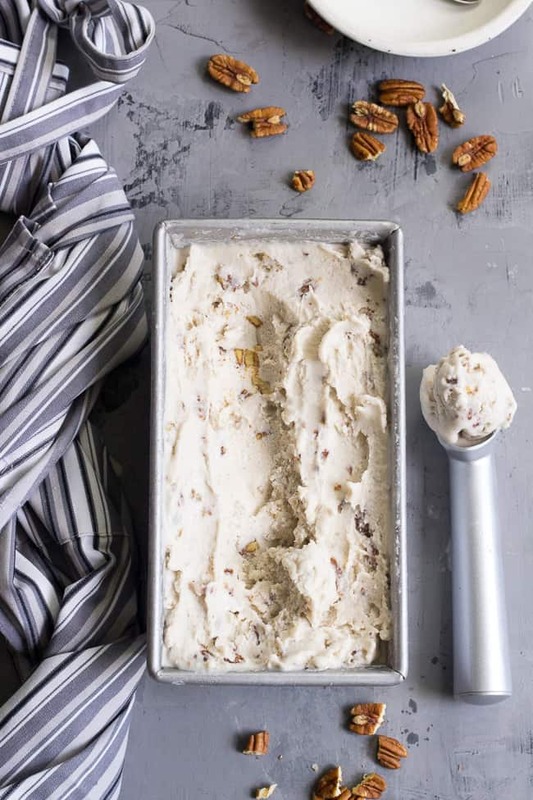 Churn for about 25 minutes, then add the toasted pecans and continue to churn 2-5 more minutes. After churning for 25 minutes my ice cream was similar to a soft serve consistency. 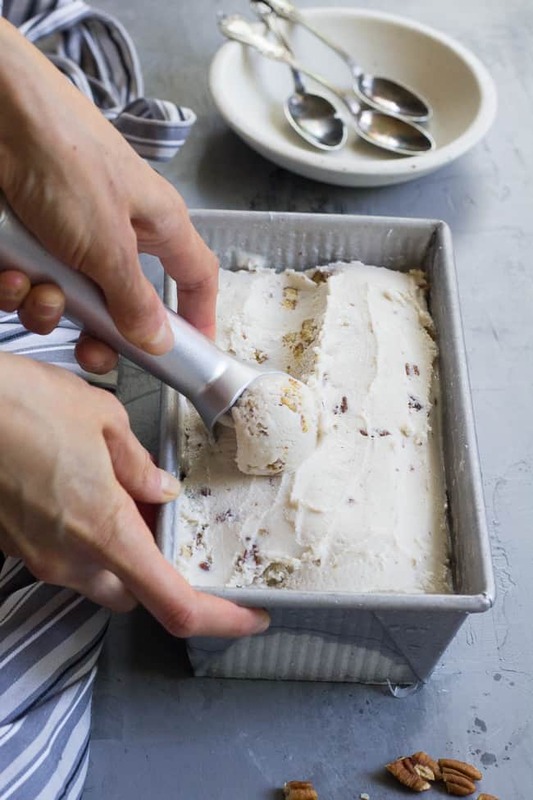 Transfer the mixture to a loaf pan or other freezer safe container and cover with plastic wrap, making sure the surface of the ice cream is in full contact with the wrap to avoid ice crystals. Allow the ice cream to remain frozen for 2-4 hours before scooping. Once frozen, you’ll need to let the ice cream sit at room temp for 15 minutes or so before scooping. Enjoy! 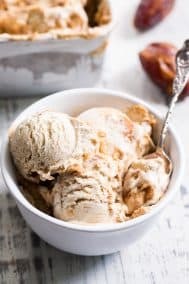 *Coconut sugar will produce a caramel-colored ice cream but the flavor is very similar! 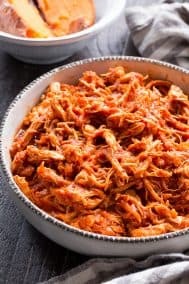 **If you use the thick part of canned coconut milk you will need about 2 cans - chill them in the refrigerator at least overnight so you can easily separate the cream from the water. Have you tried butter flavored coconut oil? This looks SO fantastic!! I definitely need an ice cream maker!! It’s been so nice to have this summer! Thanks! Funny that you just mention butter flavored coconut oil because i noticed it for the first time in the store this past weekend. i do wonder how they get that “artificial butter flavor” in it. ha! I don’t know why exactly but when people ask questions like: “what would happen if I tried this with maple syrup instead of maple sugar?” I want to scream and I am amazed that you bloggers manage to come back with something nice. So INSTEAD, I am going to say “I am going to try this with maple syrup since that is what I have and use most often” 🙂 I’ll report back. I am curious if you’ve tried any of the ice creams with maple syrup/liquid sweetener instead of the cyrstally sugar? And if so did you find it did not work? I am going to give it a go in any case. We shall see… Thanks! Haha 🙂 With the sugar and coconut milk, you’re really just making sweetened condensed milk and I don’t think using syrup would affect the texture or flavor all that much. The final result might be a bit less creamy and perhaps darker due to the maple syrup but the flavor should be pretty much the same! Hope it turns out well! 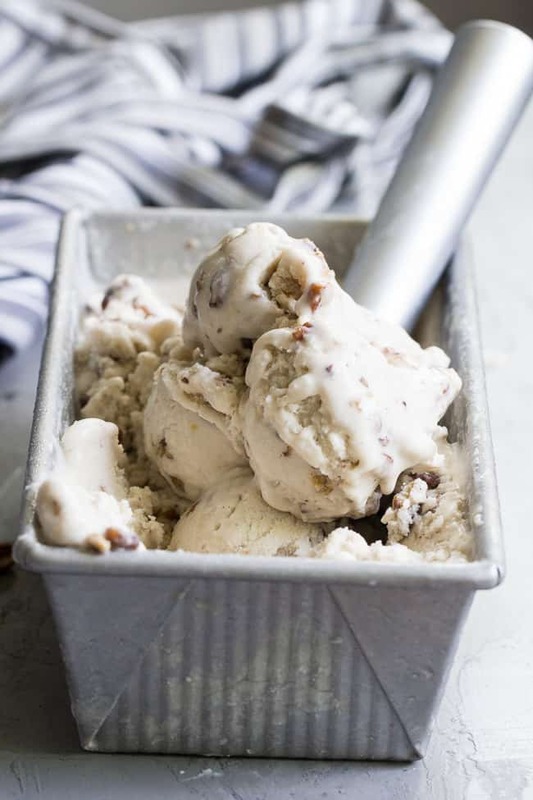 The texture looks exactly like the beloved Butter Pecan flavor that is so popular in our house. I love that you are the go to resource for any vegan ice creams that I need to make. This will have to be another option! Looks delicious! Can’t wait to try it this weekend, thanks! Hi I’m confused – you say two cans coconut milk and also one can coconut cream. You never mention using the can of coconut cream though? In step 5 you whisk in the coconut cream – this is after the cooked mixture chills – right before churning. This ice cream melts to liquid quit quickly. Is there anything that can be added to keep its form longer? I made this tonight. WOW! 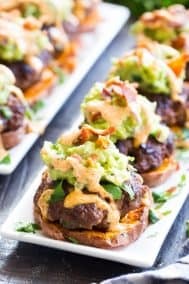 This is just what I was looking for and what I have been missing so much since going vegan. I used 1/2 tsp of salt on the pecans, which is the higher of your recommended amounts, and when I tasted them, I thought I made a huge mistake. They were not good on their own so I only put about half of them in the ice cream thinking that it would be too salty if I used them all. I was wrong… they are perfect in the ice cream and now I wish I had used them all. I will make this again and put them all in. The sweet and salty combo is amazing. It tastes just like the butter pecan ice cream I remember as a kid. 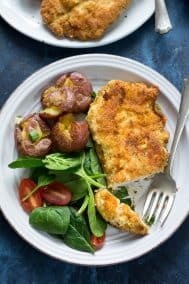 Thank you for this amazing recipe!! I’m so thrilled to hear you enjoyed this! Does it taste strongly like coconut or does it get masked by the other flavors?